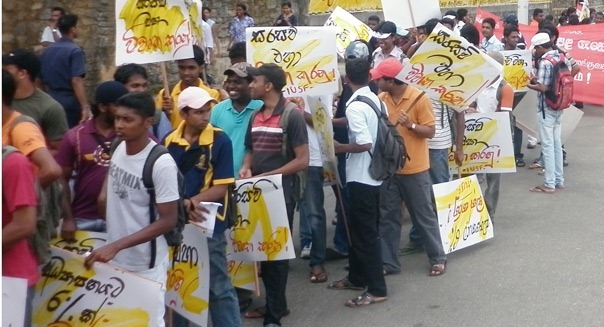 Inter University Students Union (IUSF) to held a protest march today 11 am (March 6) from Kelaniya University to Kiribathgoda Town over Hostel issues faced by students.Parents of the students will also support for this rally. A group of female students of the Kelaniya university have occupied a canteen area of the university due to an issue pertaining to their hostels. The students note that they were forced to resort to this measure as authorities who identified their issue are yet to find a solution to it. Around 300 students are currently housed in these premises. The Students’ Union of the university charges that around 800 students were denied hostel privileges this year. However, responding to a query raised in Parliament on Tuesday Minister of Higher Education , S.B. Dissanayake notes that universities have only spent less than 50% of the funds allocated to their ministry. He made following comment: “.. There is no issue about funding. What we are trying to do is to keep our expenses below 70% of the allocated funds. in 2010 a majority of the universities spent less than 50% of their allocated funds.